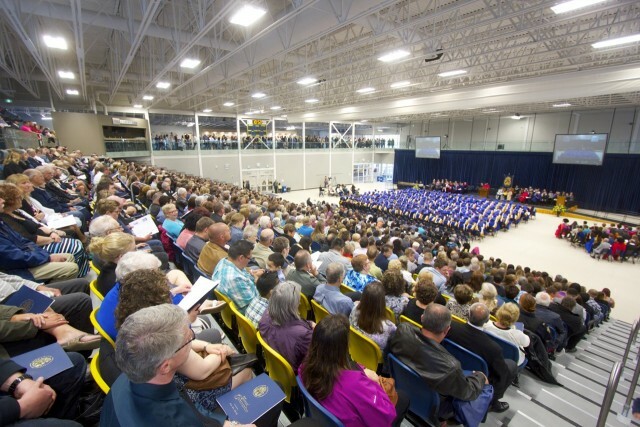 Family, friends, faculty and staff gathered today at Brandon University (BU) to celebrate the success of graduating students at the 2015 Spring Convocation ceremonies held at the Healthy Living Centre. Five hundred and thirty-seven graduates received their degrees during two Convocation ceremonies. The Faculties of Arts, Science and Health Studies were celebrated during the morning ceremony, and graduates from the Faculty of Education, School of Music and those receiving the Bachelor of Arts/Bachelor of Education Integrated degree were celebrated during the afternoon ceremony. Valedictorians Kardy Fedorowich and Jonathan Filewich spoke on behalf of those receiving their degrees. The morning ceremony conferred honorary doctorates upon The Honourable Philip S. Lee for his numerous contributions to Manitoba society, and Mr. Theoren “Theo” Fleury for his work combating abuse and for his outstanding efforts promoting healing and recovery. The afternoon ceremony recognized with honorary doctorates Ms Lisa de Wilde, for her contributions to Canadian media, arts and culture, and dedication to supporting scientific literacy, and Mr. Mitch Podolak in recognition of his service and leadership to Canada’s renowned folk festival culture. Graduation ceremonies at Brandon University began yesterday during BU’s largest ever 4th Annual All Nations Graduation Pow Wow held on the front lawn of Clark Hall on the BU campus.